This model with the Cherokee Seal inlaid into the handle is available now. . This knife was made at my home near Tahlequah, Oklahoma from 52100 round bar that was purchased from a ball bearing factory in Dahlonega, GA., the point of departure of one of the 3 groups of Cherokees on the infamous Trail of Tears. The steel was forged into a knife in the shape of a tear drop to commemorate this historical event. The handle is also tear drop shaped and is made from Bois D Arc, a tree that was cut here in the Tahlequah area, the end of the Trail of Tears. The blade is stamped with “RakeR” and “MS” on one side of the blade and stamped with 3 small tears falling from the point on the other side to represent the three groups. Not all of the tears will survive the grinding, just as some of those that started the Trail of Tears were lost. 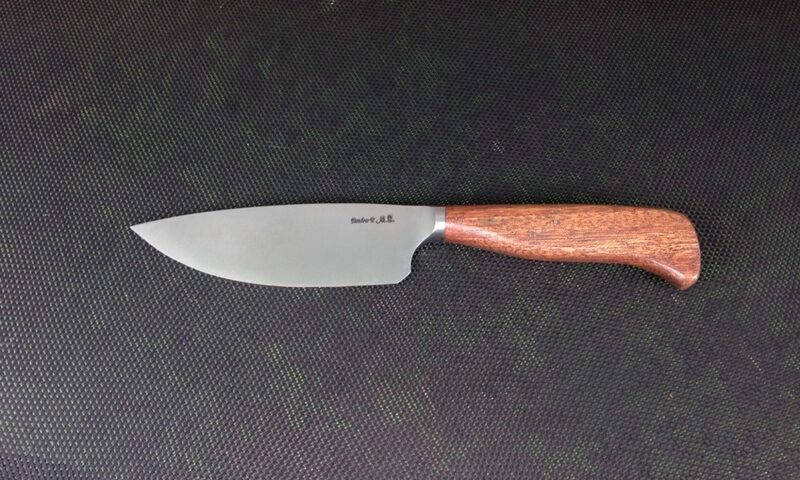 The knife will be made with a 3 inch blade and will be almost 7″ in over all length. The handle will be of hidden tang construction with a solid handle that will be attached with epoxy and secured with a 1/16″ inch diameter pin of inconel. The grain pattern on the wood will vary with each knife. They are forged in the style of my NDN models, flats left as forged and tool blackened. They will come with a Certificate of authenticity and a leather pouch sheath. A video showing how the knife was made, from start to finish is available to the public on YouTube. The total price which will include shipping is: $225.00.